Last week, BC economist Robyn Allan weighed-in on the McGuity-Redford fiasco with a post of the effect of oil extraction on the Canadian dollar, and the knock-on effects of a high dollar on Canadian industry, including the oil and gas sector. Ms. Allan makes some important points, some which surprised me, but she also makes some points which are simply not accurate. Let me start with the good, and move on to the bad. Ms. Allan points out that two Canadian Energy Research Institute (CERI) studies, on which Premier Redford, CAPP, and many other oilsands advocates rely, make some very inconsistent assumptions with respect to the future of the Canadian dollar exchange rate – their May 2011 report on Canadian Oil Sands Supply Costs and Development Projects contains the Figure below, which clearly shows that their projection for the Canadian dollar exchange rate sees a consistent appreciation to a value of US$2 per $CDN by 2044. That figure is followed, on the very next page, by a call-out box stipulating that, “exchange rate parity will be assumed throughout the projection period, as fiscal and monetary policies would likely be implemented, over the long-term, to prevent excessive appreciation of the Canadian dollar against the US dollar.” There are two issues here – first, the univariate model used to predict the relationship between the $CDN and the price of oil is woefully inadequate, since it simply relates past values of the Canadian dollar to the price of oil, and uses this estimate to project the future value of the Canadian dollar on the basis of an oil price forecast. Energy products represent 28% of Canada’s total exports, and only 10% of Canada’s total imports (oil’s share is smaller still, since we export natural gas, coal, and electricity), so the prices of other non-energy commodities will play a role – some will correlate with oil, and some won’t. Bottom line, the CERI model leaves a lot to be desired. CERI’s counter-assumption, that monetary and fiscal policy would follow an implicit (or explicit) peg to the $US at par seems equally suspect. The next issue Ms. Allan raises, also a good one, is that I/O models are static and partial-equilibrium in nature, and so they are poor at both predicting impacts from large changes and predicting impacts over time. This is definitely a problem for a report looking at billions of dollars in impacts over 30 years. CERI acknowledges this, but then, as Allan points out, uses the model anyway. There’s a long list of things wrong with using I/O models to assess impacts of oilsands development and to sell GDP and employment associated with oilsands as gross rather than net benefits, so I’m glad to see Ms. Allan taking these numbers to task. It’s important, however, to remember that it’s not just the negatives which are mis- or under-estimated by this approach. For example, Ms. Allan asks whether, “we will buy as much gasoline at $2.50 a litre as we did at $1.10?” Well, if you think the $CDN impact is going to nullify the appreciation in the oil price Canadian producers receive, it will also nullify the increase in the price Canadians pay at the pump, since both oil and gasoline are traded freely in North America. The final issue Ms. Allan raises is that all industries, including Alberta oil and gas producers, are affected by the appreciation of the dollar. For example, if you check the Alberta 2012 budget, you’ll see that, “every 1-cent rise in the exchange rate over 12 months implies $247 million less revenue.” To suggest that this is some sort of secret is as much of a stretch as suggesting that it’s all bad news. You have to remember that our dollar is appreciating because people want to buy our stuff, and this increase in demand for dollars makes our stuff more expensive. An analog: by all means keep in mind that you pay more in taxes with a higher salary…but don’t forget that you’ve got a higher salary! In general, I agree with most of what Ms. Allan wrote, right up until the end, where she suggests that more processing and/or more movement of crude oil west to east in Canada would mitigate the exchange rate effects about which she is so worried. Of particular concern is the implication, although not quite explicit in the blog post, that moving more oil from west to east would dampen the effects on the dollar, since this is dead wrong. Ms. Allan was very clear on this point on The Agenda with Steve Paikin (see 7:52). 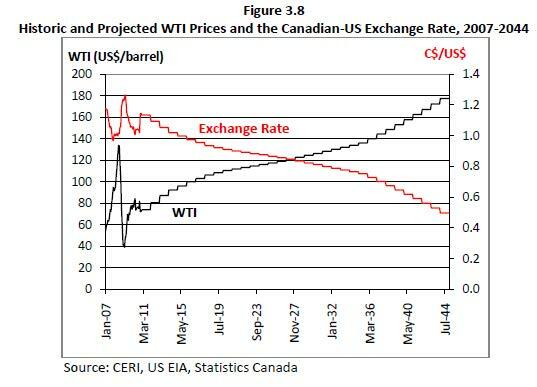 To suggest that offsetting imported oil with Alberta oil would lead to a declining Canadian dollar ignores the fact that this would, under the simplest of assumptions, be a wash in terms of net imports, and therefore have no effect on the Canadian dollar. In fact, this change would more than likely lead to a further appreciation of the dollar. How can exporting less oil lead to an increase in the value of the Canadian dollar? You have to look at net, not gross exports, in value terms, and moving more Canadian oil east would likely increase net export values, and thus put upward pressure on the dollar. In 2011 average prices for most of our exports ($95.16/bbl Edmonton PAR for light and $77.09/bbl WCS for Heavy for illustration) were lower than the price paid for at least some of our oil imports which are priced in the currently more expensive (CDN$109.91/bbl average) Brent market. Over the next 10 years, Sproule forecasts put the Brent premium at $CDN 6.93/bbl – at those prices, displacing light oil imports with Canadian oil which would otherwise be exported to the US Midwest would increase Canadian net exports by up to $1.6 billion per year. Shipping oil which would otherwise be exported to the Gulf or West Coast to the East would have no impact, since those markets would command the same prices as we pay for most Eastern Canadian imports. No matter how you slice it, you can’t make net exports decrease by shipping oil east to displace imports for Canadian consumption. The impact on net exports if we did more refining and upgrading in Canada is less clear. If you took heavy oil or diluted bitumen, and upgraded it to synthetic crude which trades at a small premium to light oil, and assuming the current Sproule forecast for the light-heavy differential holds, you’d be shipping out product worth an additional $17-18 per barrel. On the surface, higher value exports should imply a higher Canadian dollar. It’s not quite that simple though, as there are a few countervailing effects. First, you’d end up with substantially fewer barrels but each barrel would be worth significantly more – on balance, the volume decrease would be up to 50% depending on the upgrading method used, while the value increase would be less than that, so it’s likely a decrease in net exports, and downward pressure on the $CDN. Second, you have to close the loop on the net exports of natural gas liquids currently used as diluent, which would certainly increase, applying upward pressure on the $CDN. My sense is that, on the whole, the effect would lead to a small increase in net export values which would be made higher still with a move to refining rather than simply upgrading, but I’ll leave the specifics for another post. Overall, I am all in favour of as much objective assessment of figures as possible in this contentious oilsands debate and I am glad that Ms. Allan has taken up the cause. Perhaps she can further explain her contention that keeping more oil in Canada or upgrading more oil here would dampen the appreciation of the Canadian dollar, but I simply can’t see how. I look forward to the answer. I do not follow this, and suspect I am making a silly mistake. Perhaps you can enlighten me? If we are importing oil at say $109, and exporting at say $95, why won’t displacing our eastern imports with cheaper western exports reduce the value we export? Net exports – if you decrease exports by 95 and decrease imports by 115, net exports increase by 20.